The first photo in which cattle appear in their pasture is this one, taken on June 21 at 6:36 pm. Notice the absence of a cattle trail in this first photo. Then look at the photo below, which was taken ONE HOUR LATER. Seriously? A trail formed the very first time cattle walked along the fenceline?? I’m not surprised or bothered by the development of the trail, but I’m relatively shocked that it only took one pass by cattle to make it! I would have expected the gradual development of a path over a few weeks. On the other hand there were 110 cows and 110 calves in the pasture. Rich Walters, Niobrara Valley Preserve manager, pointed out that if all those cattle followed the fence line in single file formation, that was 880 hooves stepping on those relatively loose sandy soils. I suppose that would have an immediate impact. Before I go further, I’m sure some people are already mentally condemning cattle for their trail-making and other faults, but that’s not the point I’m making here. 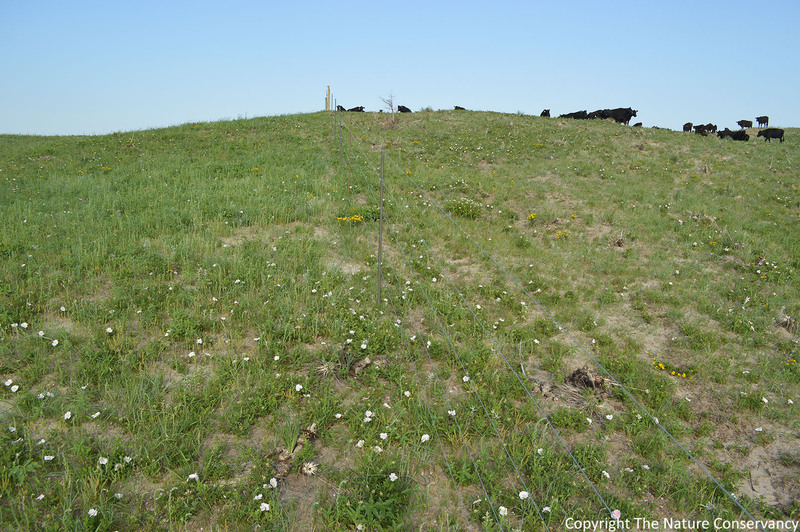 As I wrote in a recent post, I think cattle are very useful as prairie management tools, and are comparable to bison in most respects – though the formation of these narrow trails is certainly one difference between the two animals. 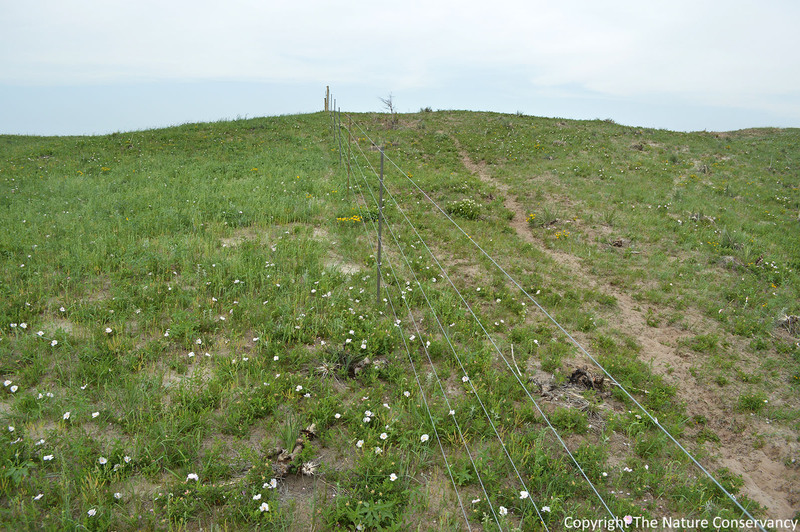 Sure, cattle trails can cause problems, especially in chronically overgrazed sites with steep slopes and erodible soils, but the vegetation beneath cattle trails can also recover pretty quickly if given the chance. In the meantime, trails can provide valuable habitat for reptiles and invertebrates looking for a place to warm up in the morning sun, and are used as transportation corridors by many other animals besides cattle. Oh, and in case you doubted me, the photo below proves that there truly were bison on the left side of the fence in 2013, though their numbers and the relative size of their pasture to the cattle pasture on the right created a very different grazing environment. The two sides of the fence looked pretty different from each other by the time cattle were removed, in terms of vegetation height and density. After my last post, several of you asked about the stocking rates on each side. There were approximately 225 bison (cows, calves, and bulls) in the 10,000 acre bison pasture to the left of this fence in 2013. They were grazing year round, but had plenty of room to roam since the Preserve staff had cut back their numbers pretty drastically following the big wildfire in 2012. At that stocking rate, bison didn’t graze very intensively in most parts of the pasture, including the area shown in this photo. On the cattle side of the fence, the 110 cow/calf pairs were restricted to only 640 acres of pasture. Even though they were only in the pasture for about 5 weeks (June 2 – July 12), that’s still a much higher effective stocking rate than that in the bison pasture. The difference in the height of vegetation between the left and right sides of the fence, then, is due to stocking rate, not grazer species. I’m already learning an awful lot from looking at the first year of timelapse imagery at the Niobrara Valley Preserve, and much of what I’m learning has been unexpected. The rapid formation of a cattle trail is a great example. I’ll be sharing another example within the next week or two, though it’s more of a mystery than a lesson at this point. For now, I’ll just tease that post by saying it has to do with a stick that moves by itself… You can have fun thinking about that for a while! This entry was posted in Prairie Management, Prairie Photography and tagged cattle, cattle trail, cattle trail formation, development of cattle trail, grazing, niobrara valley preserve, prairie, timelapse, trail development by Chris Helzer. Bookmark the permalink. Chris, I wonder if some of the trail is clearer in second photo due to light change. If you notice the fence line is nearly invisible in first pic and very clear in the second. Just an observation and who knows what that’s worth. Ernie – I actually wondered about that too, but after looking at all the previous and subsequent photos (thousands of them, from all times of day) in the timelapse series, it’s definitely a new trail. I guess the moral of Chris’ observations is the lack of thought that went into chopping up land into random blocks and fencing it off. If fences did not proceed down a hill at more than half the downhill slope then erosion from trails would not be nearly as problematic. Another way of illustrating the previous comment is the fence should be at a greater diagonal to the “fall line” of water. In addition, putting some long gentle curves into the fence would prevent the flow of water from accumulating thereby reducing erosion further. The trade off is a curved fence line would take some additional fencing. The more difficult problem may be to get both neighbors to agree to something that would benefit them both. I don’t believe Chris’ pictures are an example of the difference between cattle and bison. I’ve been to areas after a herd of bison had moved through and they were even more heavily trampled than the cattle side of the fence in Chris’ pictures. I think the heavily trampled trail on the cattle side of the fence is merely due to the cattle pacing along the fence trying to find a way to the better grazing in the bison pasture. I’d like to revisit something Chris alluded to in his post – bare ground isn’t automatically a bad thing, whether it was made by bison or cattle, or whether it appears to be evenly dispersed across the surface or in a linear arrangement (both sides of the fence have LOTS of bare ground but the spatial arrangement differs). Given the sandy soils at this site, a phenomenal precipitation event would be required to move water down that trail. An argument could be made that, from the standpoint of biodiversity conservation, this ecosystem doesn’t have enough soil erosion (think blowout penstemon). Thanks Steve, I was going to say much the same. I also don’t think that land is chopped up randomly. The fence in this photo was actually put in to shorten the amount of fence the staff needs to maintain, which reduces the amount of time spent fixing fence and increases the amount of time they can be doing other conservation work. And, as Steve says, in this landscape, water erosion on cattle trails is just not an issue. Also, in the sandhills, trying to build long fencelines that don’t go up or down steep hills would result in some crazy looking fences that wind around all over the place and would be both expensive to build and very hard to maintain. Next, as I said in the post, I don’t see this trail as a problem at all, just an interesting phenomenon. And finally, no, the cattle aren’t pacing the fence trying to get to the other side. 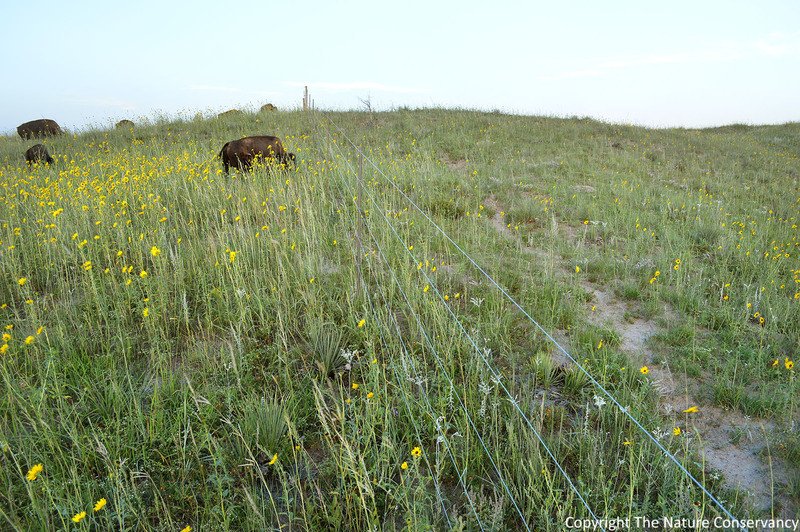 The grass is just as good on the cattle side (and equally green…) as on the bison side. I think you have a good point about the cattle not pacing the fence. Now that I think of it, cattle make trails just like the one in your photo through the middle of every pasture I’ve seen. However, I think your statement “… in this landscape, water erosion on cattle trails is just not an issue.” is one you will eventually reconsider. The limited precipitation and quick movement of water into the soil may help slow erosion on this livestock trail, but I think erosion will eventually become an issue. Particularly if a gully forms that gets so large you have to move the entire fence. I know you think my suggestion of having a fence go up hill at only half the degree of slope sounds expensive and odd. As an example, if the slope is at a 20% grade then the fence should be placed on the diagonal until it rises at only a 10% grade. Trail builders call this the “half rule.” It does not prevent you from making trails, or fences, that go uphill. However a trail, or fence, should not go straight up the slope of a hill. Compared to how people lay fences in your area I can understand why you would think my suggestion was strange. However, I know you took a vacation in the mountains not very long ago. Did any of the trails you hiked take you straight up the steepest slope or did they climb diagonally up the mountain? Did they have some crazy looking curves and maybe even switch backs in the trail? If livestock are going to follow a fence and make a trail then a fence should be laid out to reduce gully erosion. In looking at the pictures of the fence, I was struck by its apparent flimsiness as a structure to confine bison. I recall reading Dan O’Brien’s marvelous book “Buffalo for the Broken Heart” several years ago, in which O’Brien dwelt at length on the need for very robust fencing to hold bison in their intended area. Chris, is that porcupine grass in the foreground of the buffalo pasture? I’m wondering about about how well cool season native grasses fare under a short intensive, relatively early season grazing regime, because it doesn’t look like much was able to go to seed in the cattle pasture. Patrick, it’s not porcupine grass, but there might be needle-and-thread there. Hard to ID plants from this distance and at this resolution. Cool-season grasses won’t bloom if they are grazed hard, but as long as it doesn’t happen every year for many years in a row, they do just fine (including, unfortunately, the invasive ones!). After reading the comments Chris made about the trail I went back and looked at ALL the pictures in the previous post and I noticed that the trail began to recover almost right away after the cows were removed. The trail was still obvious but will probably be colonized by the next season provided the cattle don’t return. And doesn’t this fall in to the category of disturbance that promotes diversity? And wouldn’t erosion be an issue only if the pasture is chronically over grazed? I did not intend to be critical of your crew’s fence making skills. I do think land was divided up in a rather random pattern when one considers topography instead of political divisors like the Homestead Act. Making the fence go up the slope more diagonally would actually increase the length of trail and trampling while also reducing erosion. However, that does not seem to matter since it seems I’ve been out voted in the matter (3-1), so it’s time for me to abandon my argument. I don’t like fences either! I like this couple of posts and look forward to the next one, Chris. I continue to be dismayed at how some eastern prairie enthusiasts have in essence shut themselves off from even considering the impacts of cattle on prairie vegetation and soil (but bison are okay in every way), when you present it in so fascinating a manner. By the way, I can think of several insects, in diverse taxa, that would relish the bare soil of a cattle path. Some reading I did about savanna restoration in Mozambique seems relevant. When the large grazers and browsers of the savanna had been virtually eliminated by civil war human activity, grasses grew so rank that (among other things) fuel quantity and resulting fire intensity hugely increased, rendering fires much more dangerous and destructive, even to organisms that could tolerate lower intensity burns. Grazing in North America’s grasslands seems likely to have a similar impact of reducing overall intensity, while increasing heterogeneity of level of combustion. Now that elephants, rhinos and other large herbivores are being restored in the area (Gorongosa NP), the grassland vegetation is less uniform, but less likely to make good landscape calendar pictures. Yet, it is apparently supportive of more biological diversity (data just coming in through biological survey work in the park). There is so much we still don’t know. In my neck of the eastern prairie, there are very few “remnant” prairies managed by cattle. And of the few I know about, the “prairie” is really just non-native cool-season grass with an occasional hoary vervain plant as well as a few other species cattle don’t seem to like. Among prairie enthusiasts, it is not surprising to me that grazing is not an accepted management practice given that some of our best prairies were not grazed (no visible evidence of past grazing) or many more that were grazed but have undergone decades of hard-fought restoration work using management practices other than grazing. Combined this with the highly-visible environmental issues (severe erosion, cattle free-ranging in streams, vegetation so short that a mouse can’t even hide) present in many of our local pastures and it is not hard to understand (at least to me) why cattle grazing is viewed as bad. There are also practical limitations such as the small size of the majority of our remnants and the logistics of getting cattle on and contained on a relatively small piece of land. We do have proponents of grazing. They tend to be entomologists or herpetologists concerned about overuse or improper use of fire and the negative impact on prairie communities other than plants. My wife and I attended a prairie enthusiast conference just this month. It was great to be among like-minded folks. However, it did not take long before the bickering began among the different enthusiast factions staunchly defending why their preferred management practice is best. I couldn’t help but think that we have 1200 prairie enthusiast members in a geographical area that ~ 16 million people call home and yet we can’t see the strong bond that we (enthusiasts) have in common over our much smaller differences. Passion and human nature I guess. But we prairie enthusiasts need all members as we are such a small minority of the larger population! I think if we had a few land managers nearby that carefully and thoughtfully utilized cattle in prairie management, opinions may change over time. I found it thought provoking regarding what is “pristine” nature! Chris Helzer, thought you might be interested in a conference at Oxford this week, though maybe you already know about it. I know presenter Jacquelyn Gill very slightly, I suspect you have seen her pubs in Science and other journals. One of co-authors with her is my friend prof. Guy Robinson of Fordham U. Looking back on your previous post “Fenceline Timelapse”, maybe I am seeing things, but I can clearly see the trail on the May 2nd photo well ahead of the “first time cattle walked the fenceline”. Cows are being opportunistic and taking advantage of a trail formed prior to their arival.